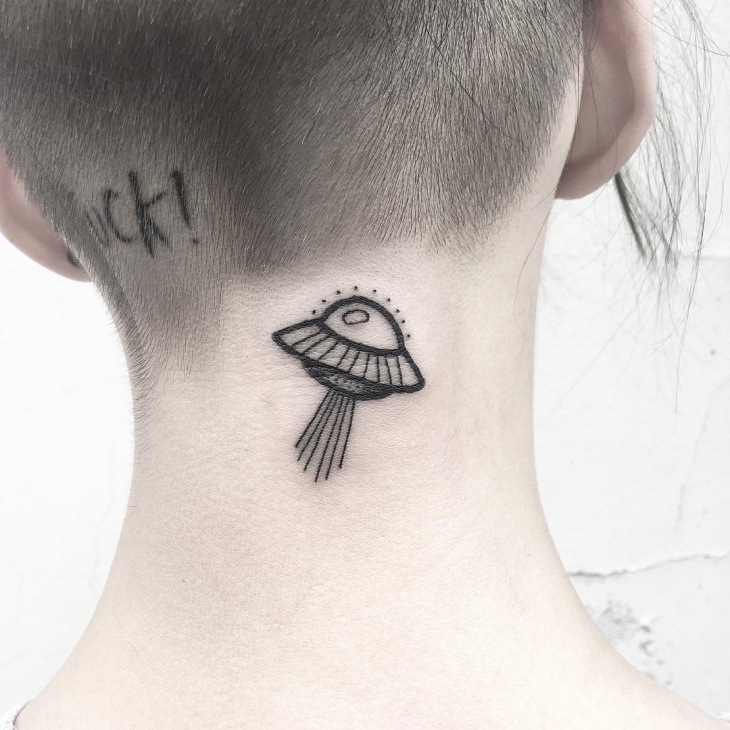 This tattoo featuring a UFO and a skull needs a lot of delicate work. It requires dot work and line work that could take a long time, however, it is totally worth it. Extra care should be taken when working on the skull’s design. 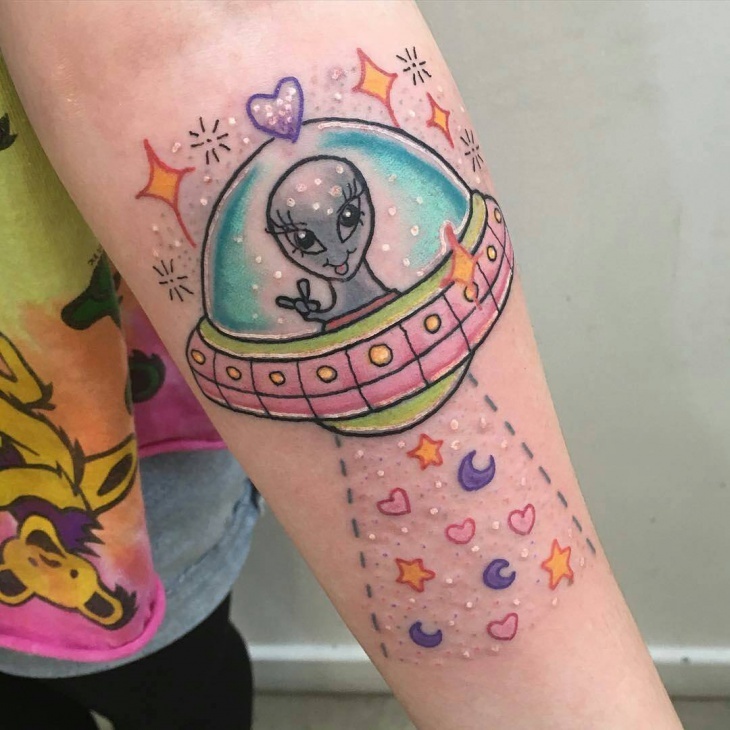 This tattoo is more artistic than sending out a message, this is a dot tattoo that requires a lot of detail. 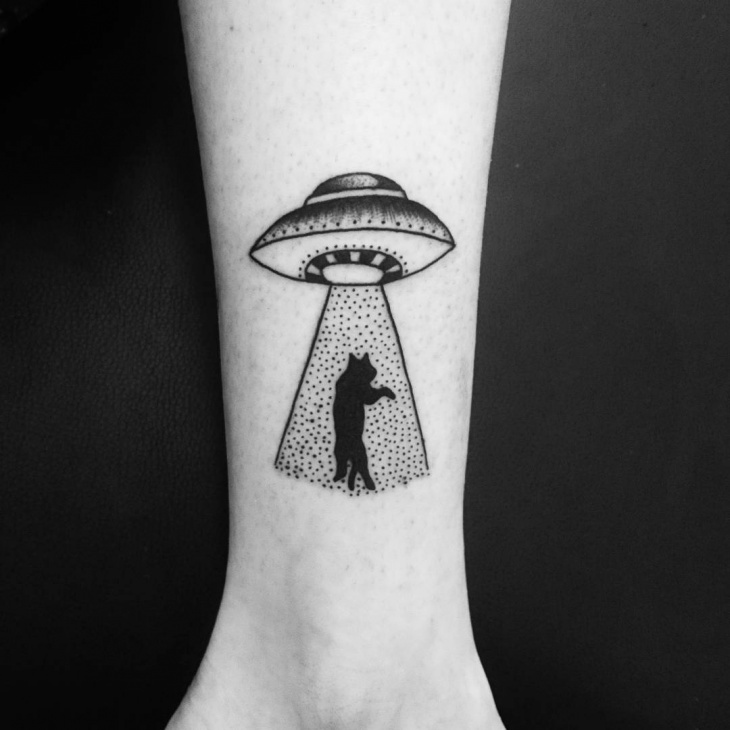 It is a cover-up tattoo featuring a human being abducted by a UFO. 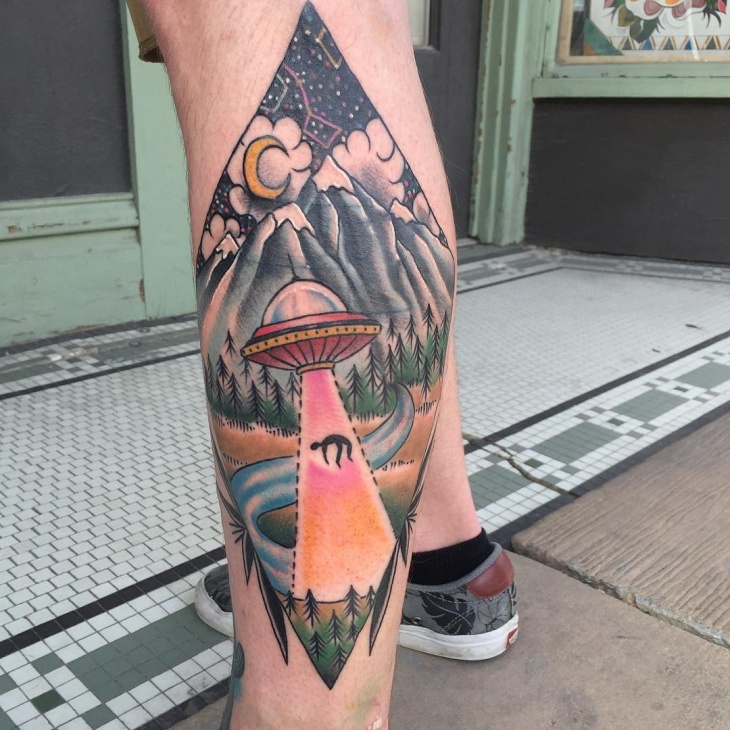 The cover-up artist has included a scenic background of mountains with a river running through, with a backdrop of clouds, moon and a starry sky. It also has a diamond-shaped border. 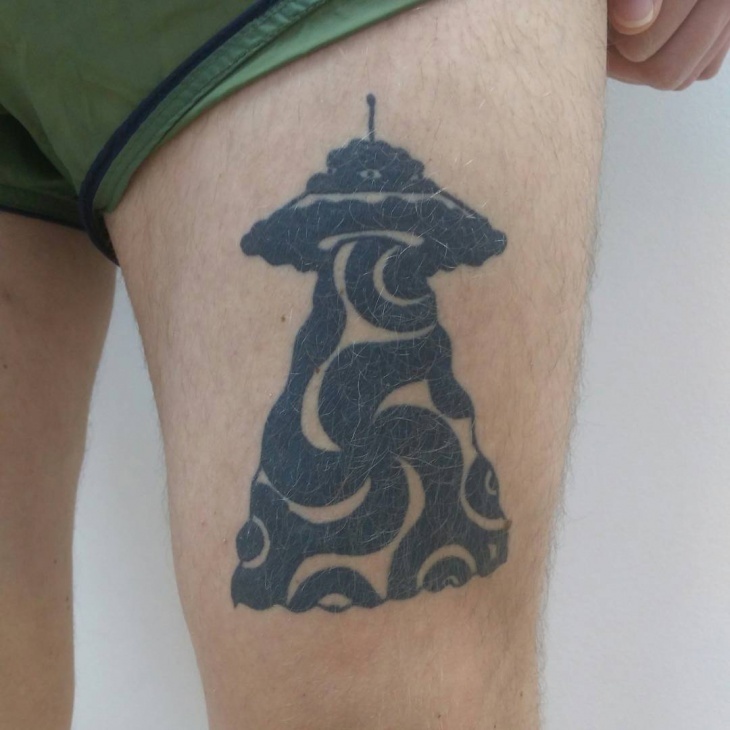 The tattoo requires a lot of patience and skill. 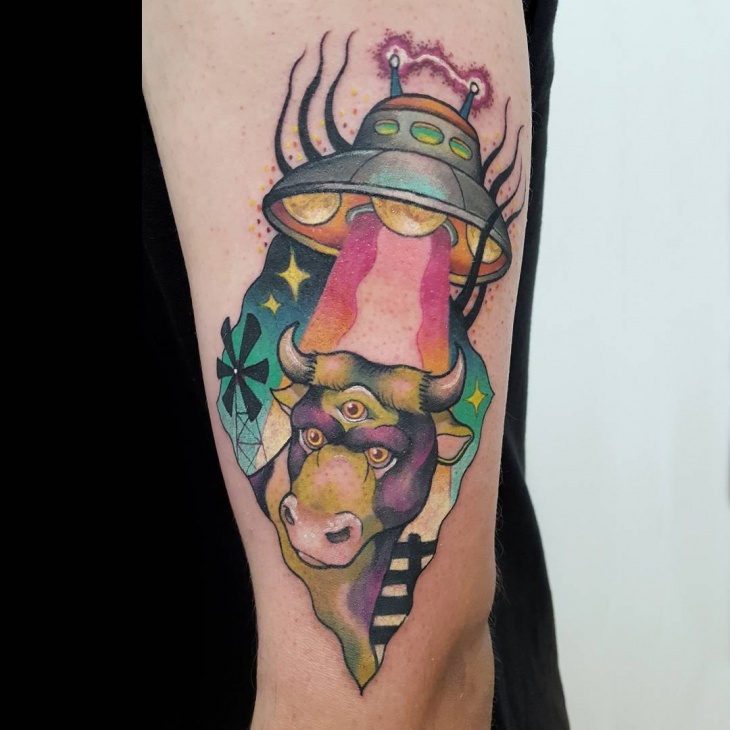 An ode to the X-Files, the sci-fi TV show featuring the words ‘I Want To Believe’, with a fox being abducted by a Pagoda style UFO and colorful flames in the background. 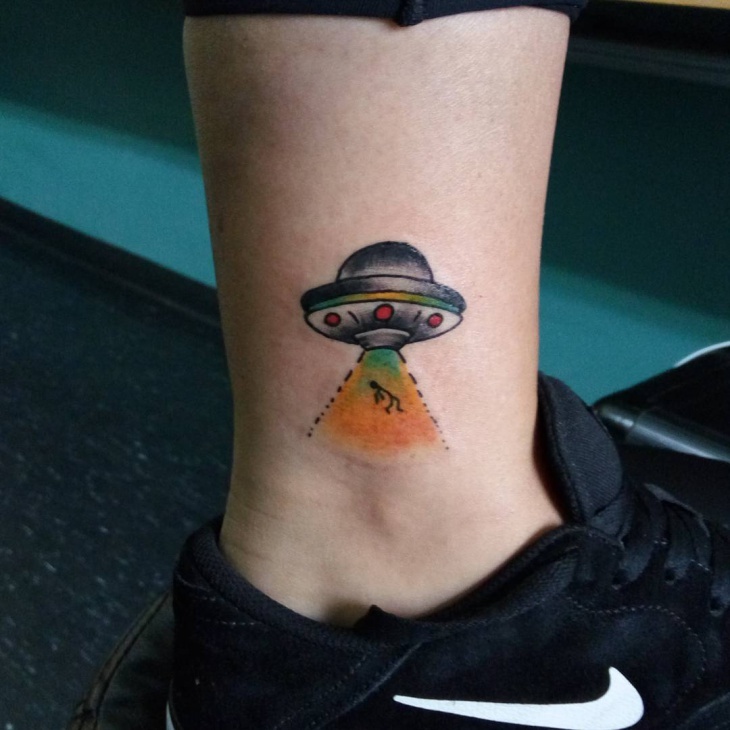 The TV Show is a popular theme for UFO Tattoos. It requires a lot of attention to detail and the colors need to be matched in the right manner. 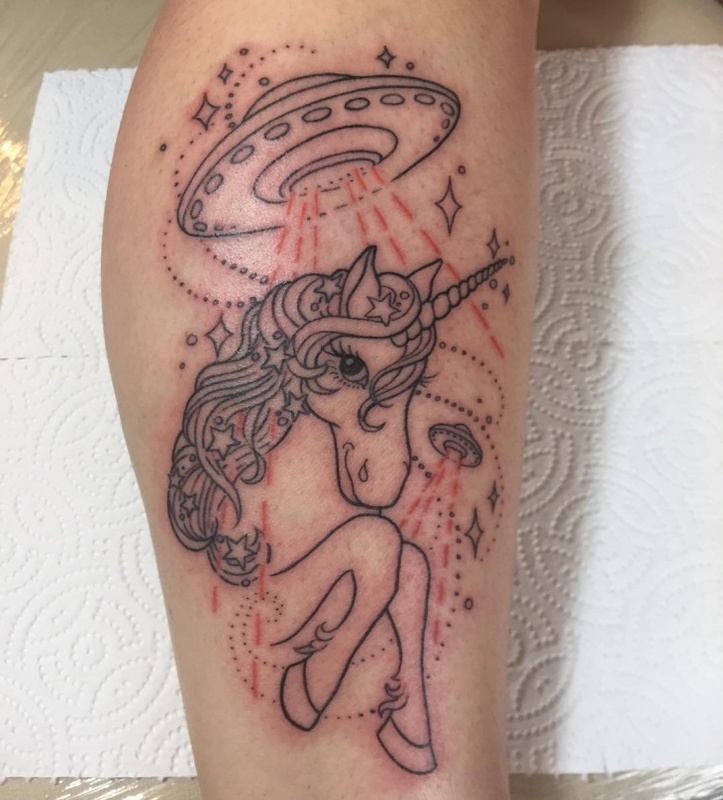 A tattoo as big as this will be perfect on the calf area of the leg. 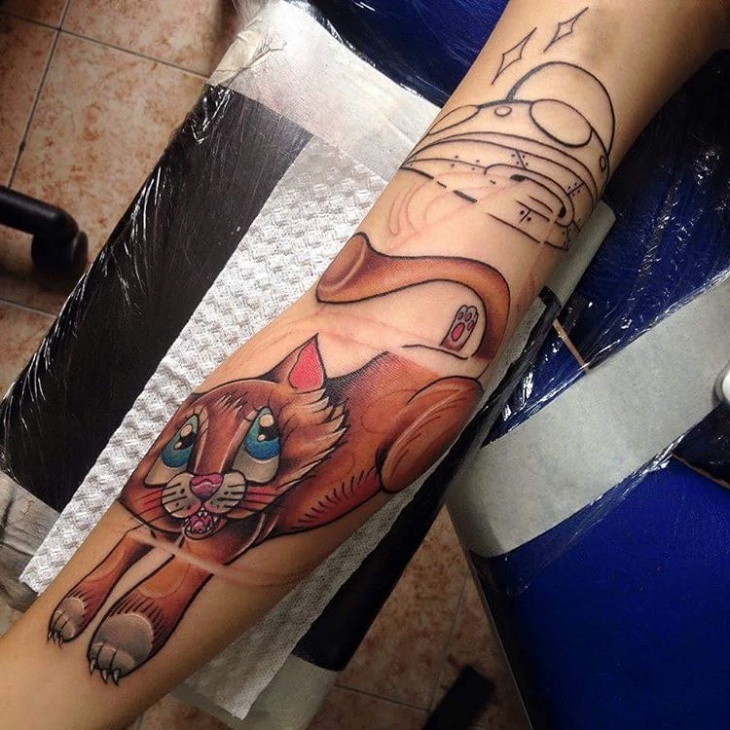 While this tattoo idea is traditional, it requires a lot of skill on the part of the tattoo artist to get it right. 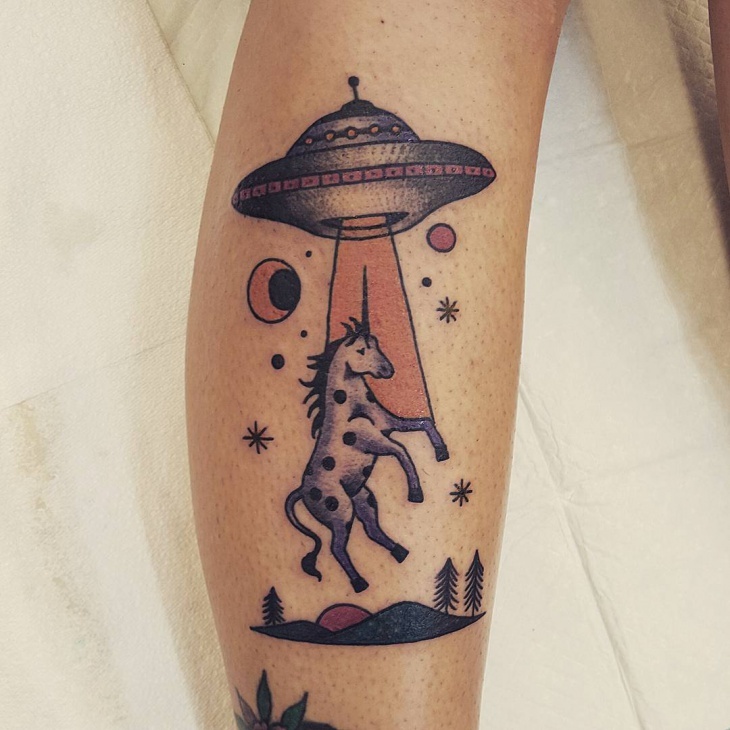 The unicorn being abducted by aliens with the moon and stars on the backdrop. This requires some delicate work in trying to get the shade absolutely right. A basic idea that needs a lot of dot work and line work. 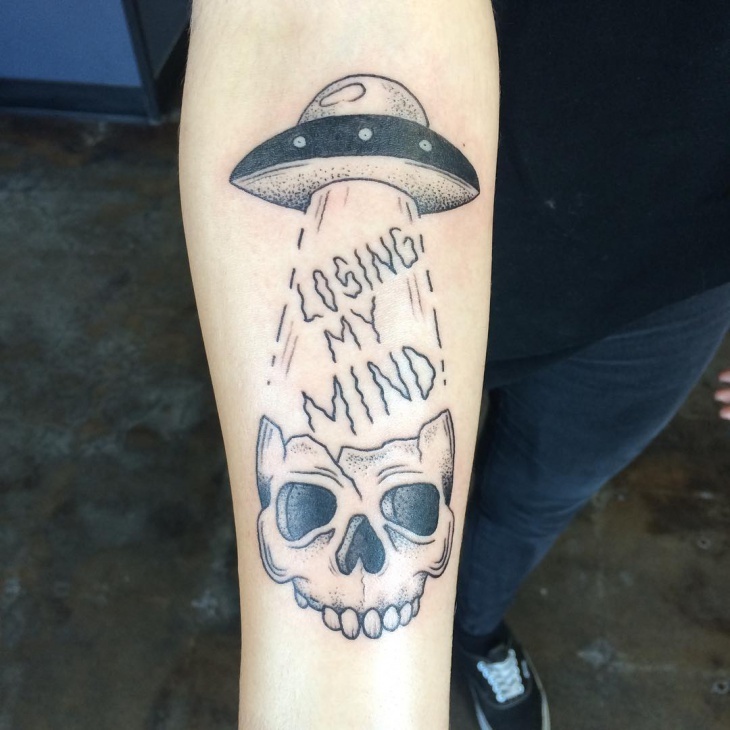 A cat being abducted by a UFO from a house, it may sound simple. 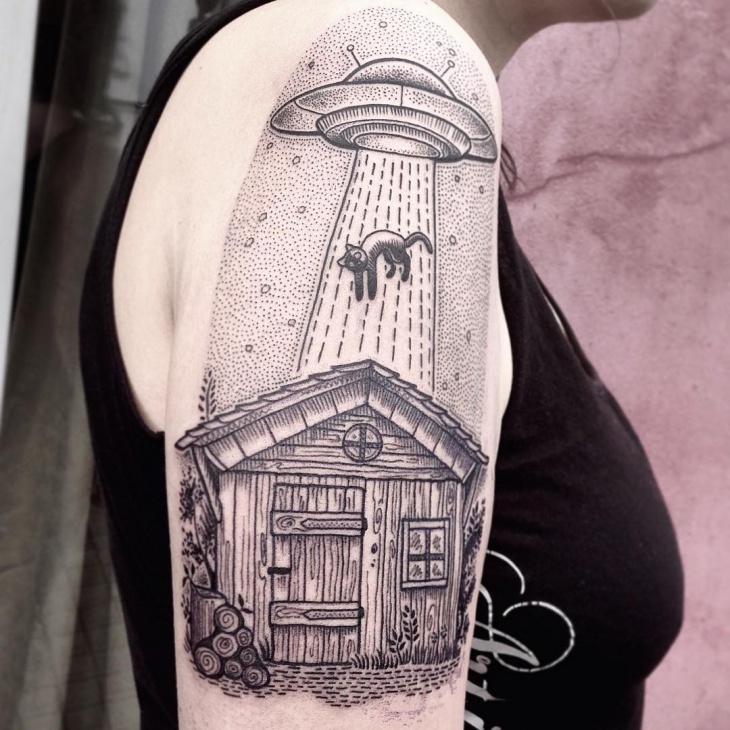 But getting this tattoo right will require a lot of attention, especially the depiction of the wood in the house, the background, and the line work. It will be perfect for a woman who wants a half sleeve tattoo. 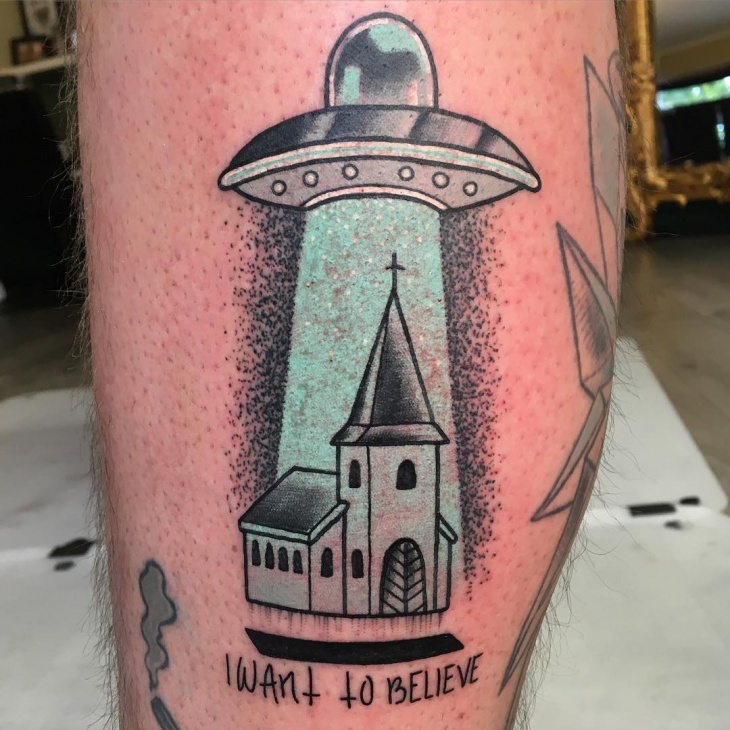 ‘I Want To Believe’ features again in this tattoo in reference to the term being used in the X-Files. 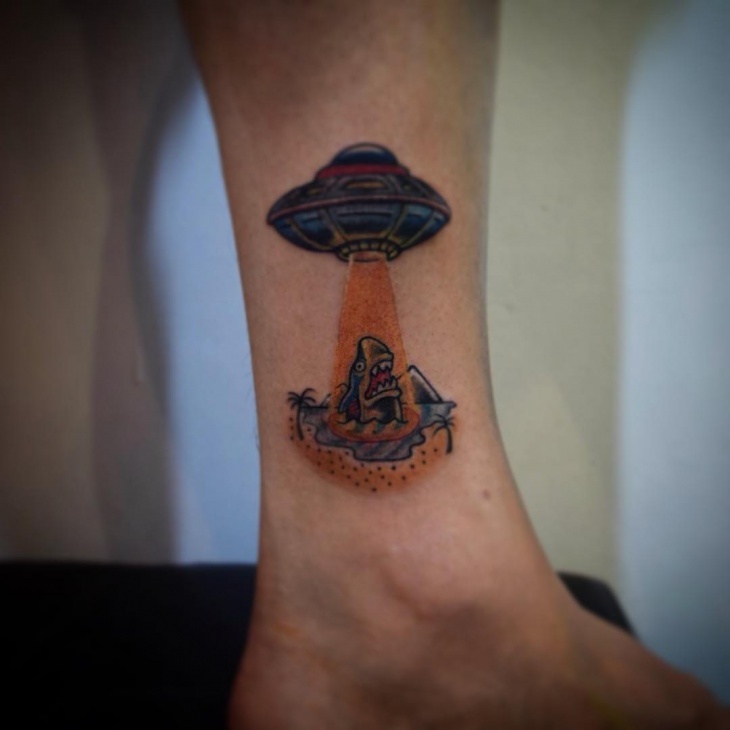 A church is being depicted as being abducted by a UFO. Some dotted work is required to fill up the background along with light blue shade to show the light. The UFO is a 60’s depiction. Getting the design right will take a lot of hard work but it is bound to pay off. 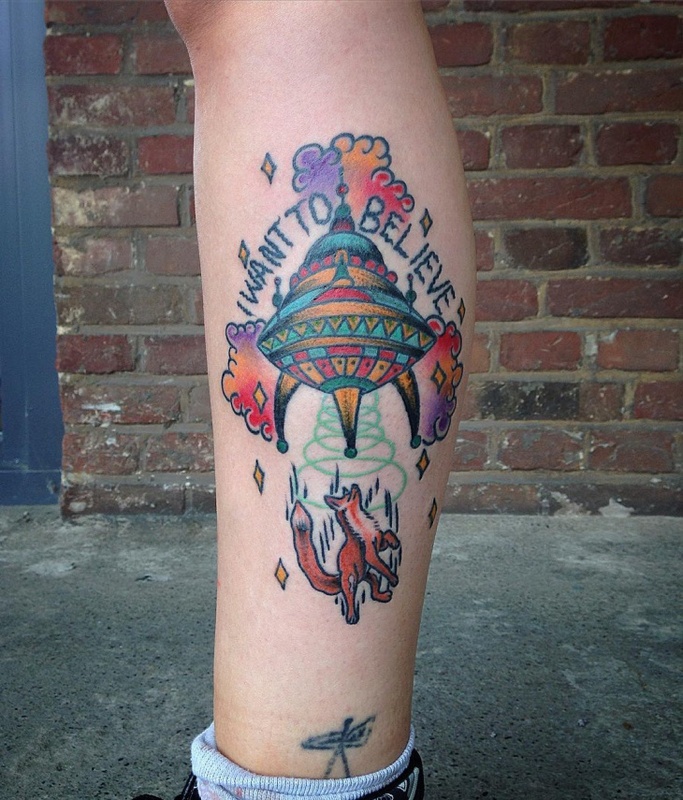 Another tattoo of a UFO abducting a cat, this one is much more creative. More attention has been to be given to the features of the cat, with the brown color being prominent whereas the UFO can remain in black and white. The cat is pictured trying to run away. 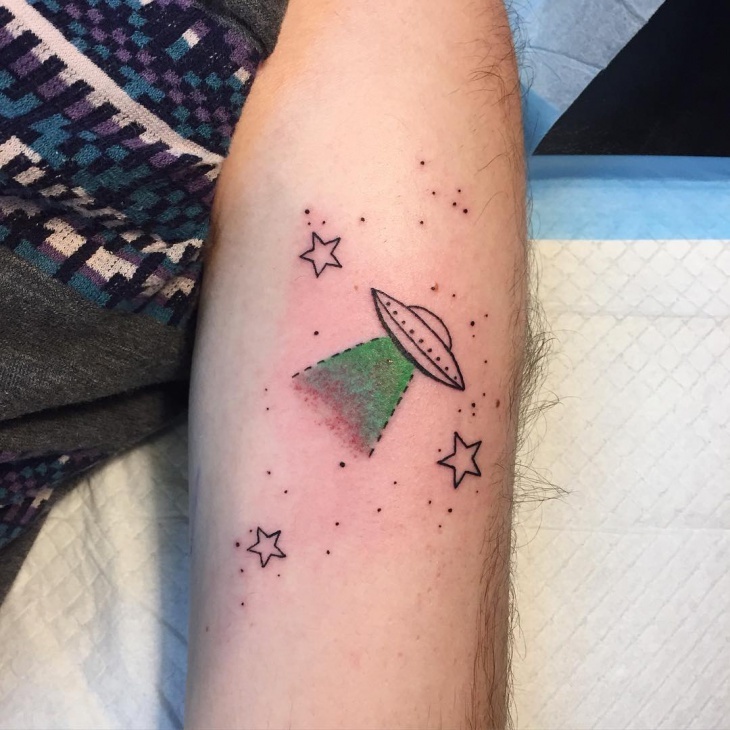 This will go well on the forearm. This is a small tattoo on the thumb but requires a lot of skill in terms of the artist and pain for the client. 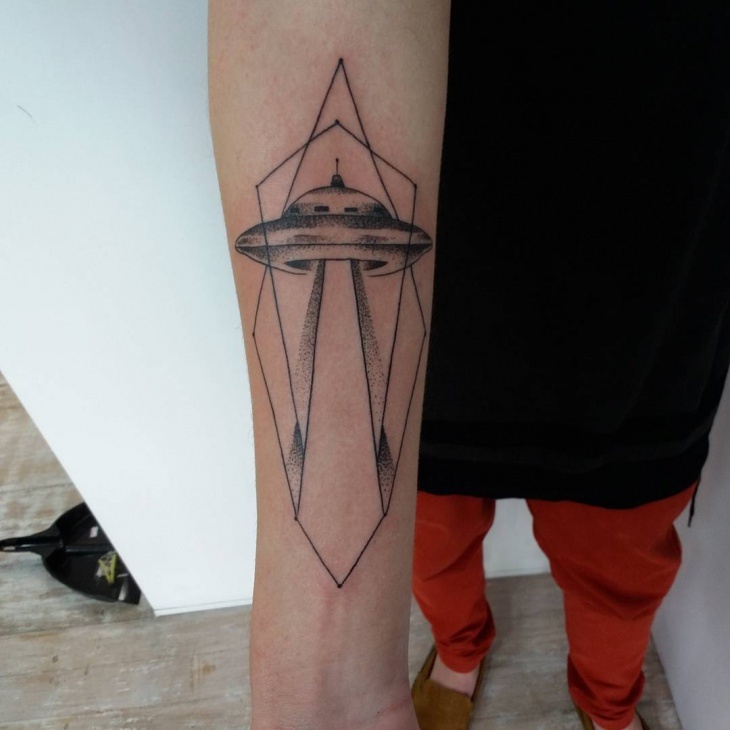 The tattoo is a basic UFO designed quite simply. This is one of the hardest tattoos to design but yet one of the most beautiful. 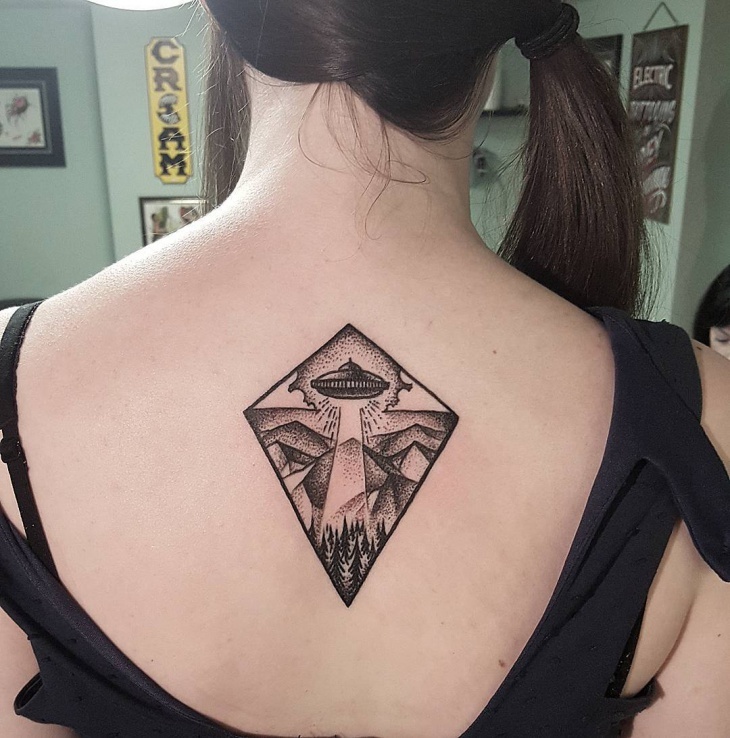 It showcases two triangles, almost in a Pyramid shape facing away from each other. 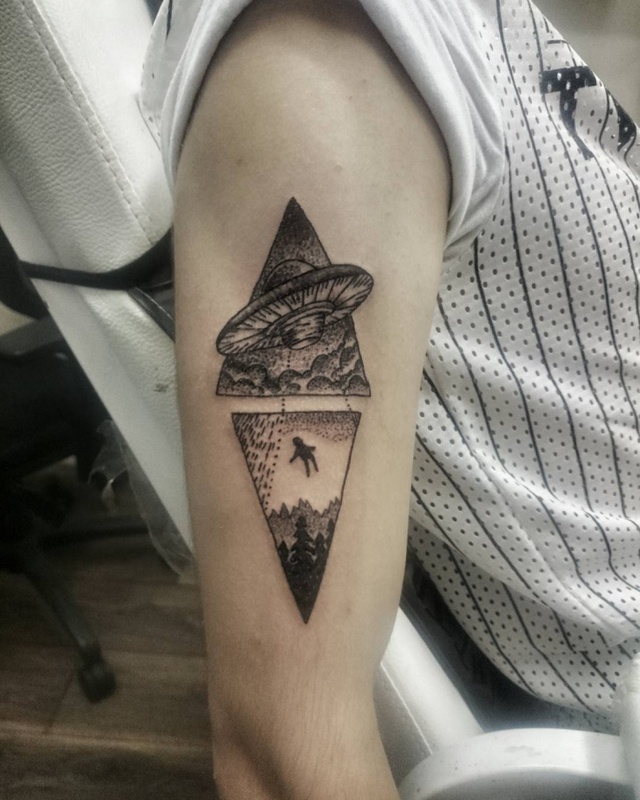 There is a spaceship on one triangle and the abductee is in the other triangle moving closer towards the UFO. The spaceship is made to look bigger that the triangle and the dot work required is immense. The dotted lines connect the two triangles at one point. Will look excellent on the shoulder. Another delicate blackwork tattoo, this tattoo requires perfection. 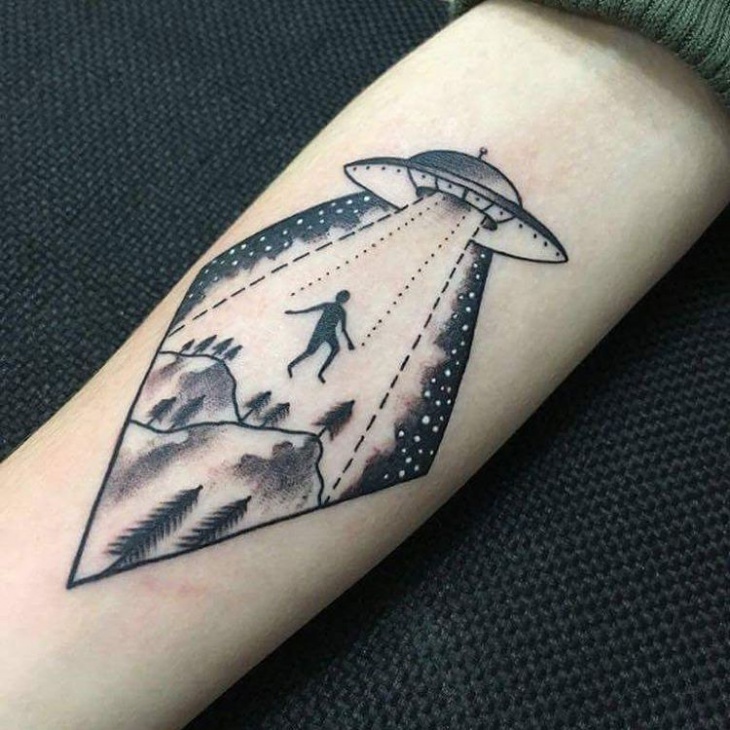 The UFO abducting a human with dot work and line work on either side of the human, the endless sky in the backdrop with stars. This can look quite plain but is quite extraordinary work from the artists end. A shade of gray is put in to differentiate between black ink and the background.